► Perform step 3 after waiting for about 60 seconds (less than 90 seconds). 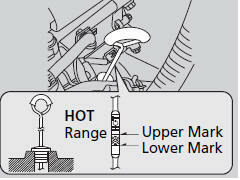 ► It should be between the upper and lower marks in the HOT range. Using a transmission fluid other than Honda ATF DW-1 may adversely affect the operation and durability of your vehicle’s transmission, and damage the transmission. Any damage caused by using a transmission fluid that is not equivalent to Honda ATF DW-1 is not covered by Honda’s new vehicle warranty. 2. Remove the transmission filler bolt and washer. Carefully feel inside the bolt hole with your fingers. ► Check if the fluid level is up to the edge of the bolt hole. 3. 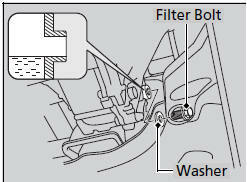 If the fluid level is not up to the edge of the bolt hole, add Honda Manual Transmission Fluid (MTF) until it runs out of the hole. 4. Put a new washer on the filler bolt, then reinstall the filler bolt. If Honda MTF is not available, you may use the API certificated SAE 10W-30 or 10W-40 viscosity motor oil as a temporary measure.